Springtime was stirring this month with the return of the 24-hour soccer game to Rockefeller Plaza. Read more about the event and the New York City Football Club here. Eater headlined the "new food infusion" coming to Rock Center: David Chang's chicken sandwich spot Fuku, Black Seed Bagel and Van Leeuwen Ice Cream, all opening in the spring. Meanwhile, Crain's highlighted the upcoming expansion of Blue Bottle Coffee in the Concourse. 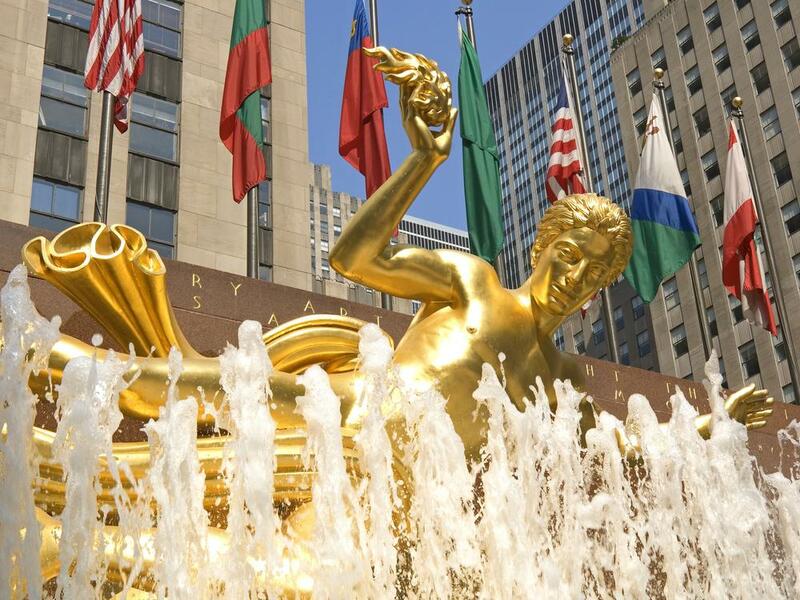 Also coming soon is Frieze Sculpture at Rockefeller Center, an extension of NYC's annual international art fair. The New York Times wrote about what to expect at the exhibition of work by 14 contemporary sculptors. Read our preview of the event, taking place April 26 through June 28. Saturday Night Live and Shrill star Aidy Bryant talked with The Cut about her weekly routine, including writing and prepping for SNL, and ordering from her "30 Rock spots" to keep her going through the day. The Times wrote about a revival of interest in the work of Marguerita Mergentime, who designed textiles for Radio City Music Hall, and whose graphics are appearing in a new line from MoMA. Some of her innovative pieces can currently be seen at the exhibition Tablescapes: Designs for Dining at the Cooper Hewitt (through April 14). The New York Post spoke with her granddaughter, Virginia Bayer, about rediscovering her grandmother's designs. And we were tickled to read that Prometheus sculptor Paul Manship created art deco figurines that adorned the Chicago bar Charmers for more than 70 years... and to learn that a full-size Rockefeller Center elevator is stored at the Brooklyn Museum. Another historical note—The Saratogian wrote up the espionage thriller New York Station, whose storyline involves the British secret intelligence organization based at Rockefeller Center during World War II. As it turns out, Ian Fleming, author of the James Bond series, did much of his research on the job at the Rock.